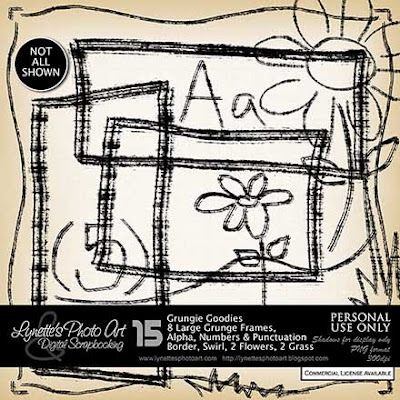 Grungie Goodies has 8 large cool Frames (seen in Boo's picture), a Grungie Alphabet with upper and lower case, Numbers & Punctuation, a Swirl, a Border, 2 doodled Flowers and 2 grass clumps - everything in the same grungie look! Only $1.99 at mt PayPal store. Click Buy It Now button below image to purchase. Today I'm giving you a word art made with this kit - enjoy! Thank you so much for this Freebie. I want to let you know that I posted a link to your blog in CBH Digital Scrapbooking Freebies, under the Page 8 post on Nov. 05, 2009. Thanks again.